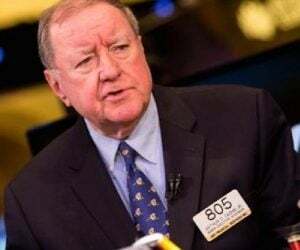 Today the man who has become legendary for his predictions on QE, historic moves in currencies, warned King World News that the financial doomsday clock is close to midnight. What is not probable, but absolutely certain, is that investors who buy the new Austrian 100-year bond yielding 2.1% are going to lose all their money. Who actually buys these bonds? 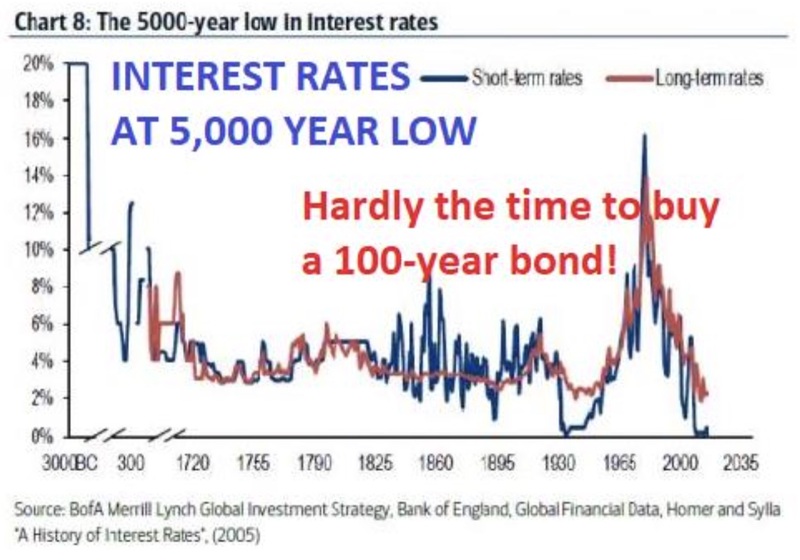 No individual investing his own money would ever buy a 100-year paper yielding 2% at a historical top of bond markets. The buyers are of course institutions who manage other people’s money. These will be the likes of pension fund managers who will be elated to achieve a 2% yield against negative short yields and not much above zero for anything else. These managers will hope to be long gone before anyone finds out the disastrous decision they have taken with pensioners’ money. But the danger for them is that the bond will be worthless long before the 100 years are up. It could happen within five years. But pension fund managers will not be blamed for their catastrophic performance. No conventional investment manager could ever have forecast the events I am predicting above. Thus, they are totally protected, in spite of poor performance, since they have done what every other manager does which is to make the pensioners destitute. The average institutional fund is managed based on mediocracy. It is never worth taking a risk in order to do something different than your peer group. 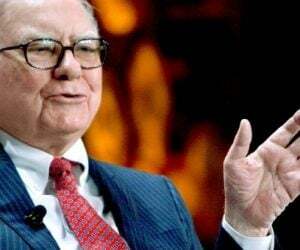 If you do the same as everybody else you will be handsomely rewarded even if you lose most of the money. Most people in the world don’t have pension coverage so they won’t be concerned. But for the ones who are covered by pensions, they won’t be much better off. Most pension funds are massively underfunded and the amount they are underfunded is absolutely astounding. We are looking at a staggering $400 trillion gap according to the World Economic Forum. The reasons are quite straightforward; an aging population, inadequate savings and low expected returns. 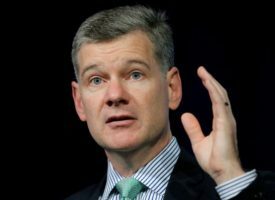 These calculations don’t take into account the coming collapse of all the assets that pension funds invest in such as stocks, bonds and property. 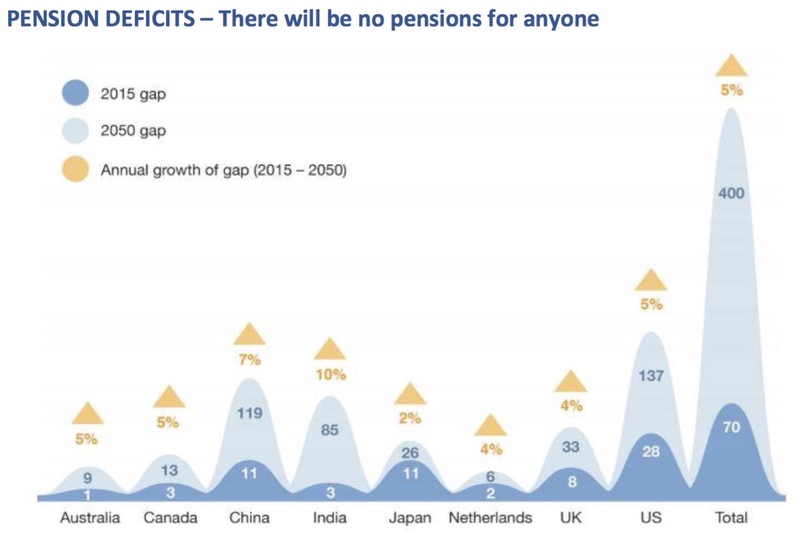 It is a virtually certain prediction that there will be no conventional pensions paid out in any country over the next 5 to 10 years and longer. The consequences are clearly catastrophic. The only country with a well-funded private pension system is India. Most families in India hold gold and as gold appreciates, this will protect an important part of the Indian population. Global debt and unfunded liabilities are continuing to run out of control. With total debt at $240 trillion, pension liabilities at $400 trillion, other liabilities such as medical care at say $250 trillion and derivatives at $1.5 quadrillion, we are looking at a total global debt including liabilities of around $2.5 quadrillion. The US is doing its part to grow debt exponentially. With the debt ceiling lifted temporarily, US federal debt has swiftly jumped by $321 billion to $20.16 trillion. 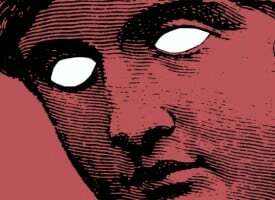 Over the last year US debt has gone up by $685 billion. 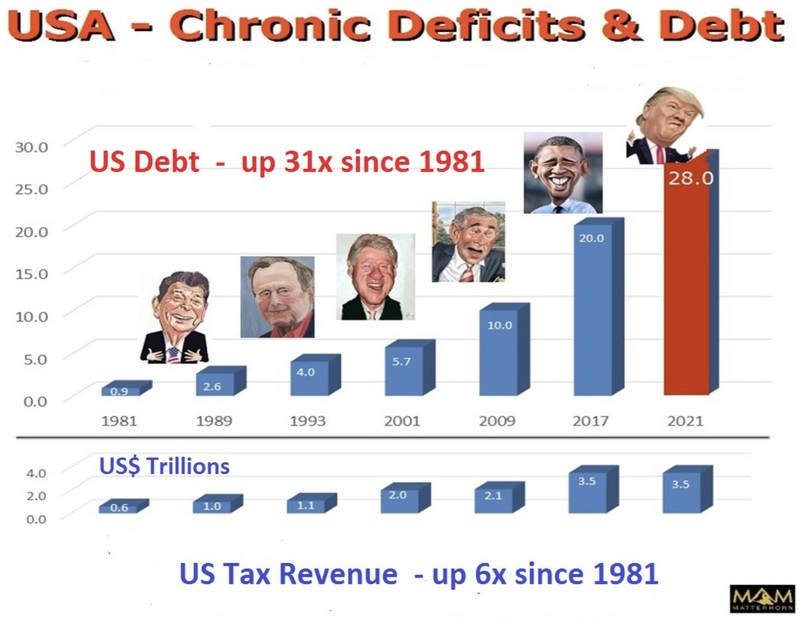 Over the next few years, US debt is forecast to increase by over $1 trillion per year, but when trouble starts in financial markets in the next couple of years, we will see that debt level increase dramatically by $10s of trillions or even $100s of trillions. As the long-term interest chart above shows, rates are at a historical bottom and the 35-year cycle also bottomed last year. Rates are now in an uptrend and at some point, in the next year or two, will start to accelerate. Within 5 years, rates are likely to be in the teens or higher, just like they were in the 1970s. Bonds will collapse, including the 100-year Austrian issue, leading to major defaults. 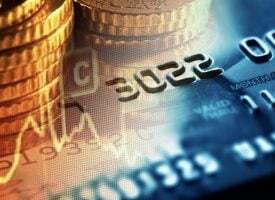 With global debt in the $100s of trillions, more and more money will need to be printed just to finance the interest costs. So more will be printed to prop up failing banks and government deficits. And that is how hyperinflation will start. In parallel, currencies will collapse and finish their move to zero which started in 1913 when the Fed was created. 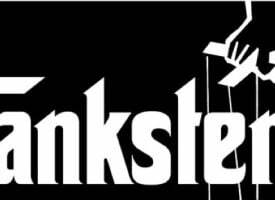 The Fed is a private bank, created by private bankers for their own benefit giving them total control of money. The Swiss National Bank (SNB) is also a private bank, quoted on the Swiss stock exchange. But it is not owned by investment bankers. 45% is held by the Swiss Cantons (States) and 15% by the Cantonal Banks. The rest is held by private shareholders. 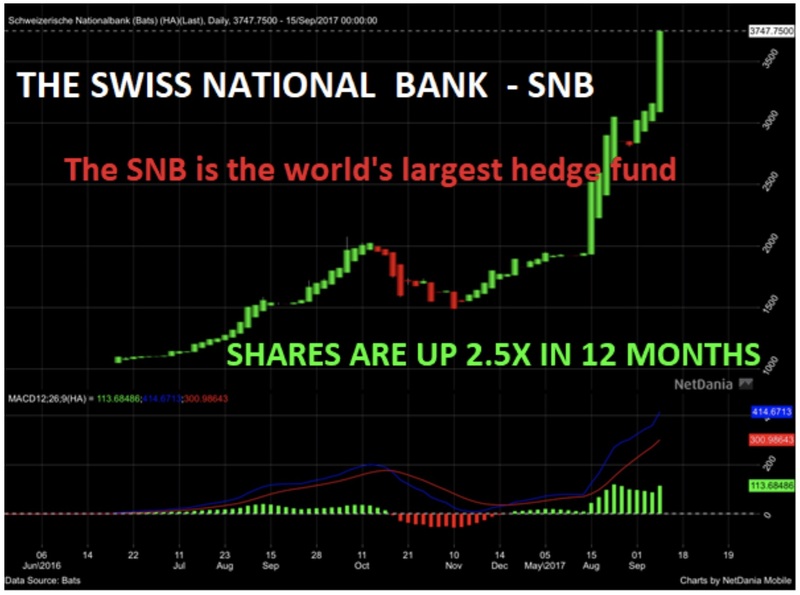 The shares of the SNB have gone up 2.5x in the last 12 months. This is the biggest hedge fund in the world with a balance sheet of CHF 775 billion ($808B). This is bigger than Swiss GDP. For comparison, the Fed’s balance sheet is 25% of US GDP. The SNB holds shares for almost CHF100 billion including $80 billion of US stocks. The rest of the SNB holdings are currency speculation with the majority in Euros and dollars. It is hardly the purpose of a central bank to speculate in currencies or stocks. Their justification is that buying foreign assets keeps the Swiss Franc low. Imagine when the US stock market turns down and the Euro and dollar weaken. At that point, the chart of the SNB stock will look very different. This is likely to happen in the next few years. Swiss banking and particularly the National Bank used to be conservative, now they are as bad or even worse than the rest of the world. The problem with the Swiss banking system is that it is too big for the country, totaling 5 times Swiss GDP. I wouldn’t keep any major capital in the Swiss banks and nor in any other banks for that matter. But the political system in Switzerland is by far the best in the world. Too bad that the banks are not! Gold and silver are seeing a temporary pause for consolidation. The chart below shows various projection alternatives compared to previous gold bull markets in the 1970s and in the 2000s. Whichever option we choose, they all lead to a much higher gold price from here between $5,800 and $8,500. Those targets are still well below my long-standing target of $10,000 in today’s money. But as I have stated many times, we won’t have today’s money because with hyperinflation money will become virtually worthless. 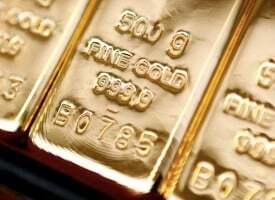 The eventual dollar price of gold is likely to be multiples of $10,000, depending on how much worthless money will be printed. 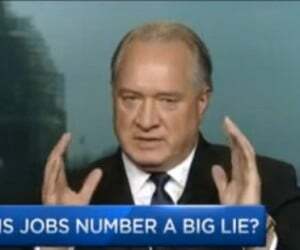 Jim Rickards talks about a massive dollar devaluation against gold to solve the US debt problem. He suggests that gold would be revalued to $5,000 which is almost 4x from today. That is of course one possibility, although I doubt the Chinese, like many of us, believe that the US still possesses 8,000 tonnes of gold. But China would probably ask the Americans for proof of their holdings and at the same time declare the amount of gold that China holds. Whoever acts first doesn’t really matter because any official revaluation of gold, or just major market price appreciation, will lead to the paper shorts running for cover. At that point, $5,000 will just be a short-lived stop on the way too much higher prices. 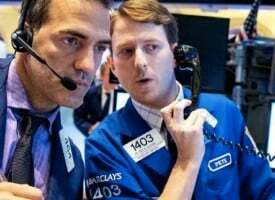 King World News note: The action on the Comex casino is noise. Weak paper longs are being taken out of the market and the bullion banks are making money on their shorts. Meaning, it’s business as usual. In the meantime, use major pullbacks to accumulate physical gold and silver as well as the high-quality mining shares. These markets bottomed in early 2016 and are on their way to new all-time highs but the ride will be bumpy. 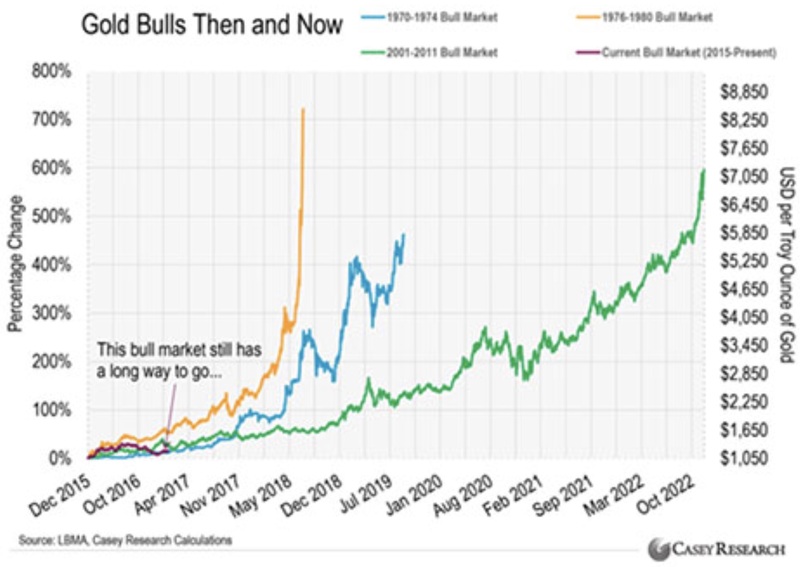 After such a long mid-cycle (cyclical) bear market (5 1/2 years), it’s amazing how many of the most ardent gold and silver bulls are either throwing in the towel or letting their emotions get the better of them. There may be more manufactured downside so the bullion banks can cover more of their shorts. Just remember, the action is designed to shake you out of your positions in the secular bull market. ***ALSO JUST RELEASED: The Gold & Silver Takedown….9 Years After QE1 CLICK HERE.